Victoria, Mahe (Seychelles) – December 24, 2018 (travelindex.com) – Welcome to Edition 51 of the Saint Ange Tourism Report. Tomorrow is Christmas and I wish to take this opportunity to wish all my family, friends and collaborators in the world of tourism and all my dear friend from the Press Fraternity a Merry Christmas. This is a time for giving and everyone will work at this in their own way, at their own pace and according to their own conscience. The important thing is to be yourself and to remain true to who you are. As Christmas approaches, as it does year after year, do you duty sincerely, always do a little more and the future will take care of itself. Merry Christmas to each and everyone. Every year at Christmas we can see decorations that light up our daily lives. Vesna Rakic posted on Social Media her thoughts about a Christmas Tree in Seychelles. Vesna said:- “When I saw this tree in the window from afar, I was convinced it was made from coconut husks. I stopped by today real quick to take a pic. It’s actually made from wood, but it’s still my favourite Xmas tree in Seychelles so far! We can be so much more creative if we try, and kinder to our planet. Well done Mason’s Air Travel”. Decorations often showcases the character and style of a person, and their ability to use local and promote cultural artefacts and material. In 2013 at the Headquarters of the Ministry of Tourism and Culture, a Christmas was erected using coconut leaves decorated with big Christmas Bows. Many appreciated it because it was very much a Seychelles styled Christmas tree. David Low Yoke and Wilson Nancy have launched their Coco de Mer jam in time for Christmas and they are expected to add a Coco de Mer Brandy to their range of ideal Seychelles unique gifts by January. Coco de Mer is a unique natural treasure of Seychelles and using the bye products locally has always been a call made in Seychelles. The exportation of the dried kernels to China was the lazy approach when work could be provided to Seychellois when working the kernels and creating value added approaches to what we have been blessed with. Congratulations to David and Wilson. Culture would not exist if we did not have people. Placing culture in the centre of what we do is placing people at the centre of our development. Being proud of our culture and all that is culture is the least one can expect from one’s own country. Culture is all its form and diversity is what makes us the unique people we are today. Seychelles has been consistently recording impressive growth in tourism, certainly since 2009 when Seychelles moved to reorganise the Seychelles Tourism Board that led to the creation of a Ministry of Tourism once again after an absence of a Tourism Minister for many years. With less than two weeks to go, and the most busy season of the year just opening up ahead of the Festive Season, has Seychelles’ tourism industry reason to celebrate once again. According to data received from the National Bureau of Statistics there has been 2% increase in visitor’s arrival compared to the same period in 2017 with 325,628 arrivals so far compared to 320,132 last year. Notably has Switzerland replaced India among the six top best performing markets during 2018. The advance of German over French visitors has been largely blamed on the lacklustre performance of French airlines JOON which had in collusion with Seychelles government departments pushed Air Seychelles off the route – to only recently announce that their flights will now only be seasonal and not year round. Germany subsequently remains the main tourist source market for the Seychelles now with a 16% market share and having replaced France as the archipelago’s leading source market for many years. Data seen also suggests that there has been a decline in the number of visitors from some important markets such as China, Russia and South Africa. The most current data from the Seychelles Tourism Board (STB) shows that the work by their Marketing Department in collaboration with the island’s private sector is paying dividends. That performance was marked by a growth over each quarter of 2018. Overall Seychelles will end the year with a total visitor arrivals increase of 3%. It is not a bad show, but is it enough when one assesses the dependency of Seychelles on tourism. 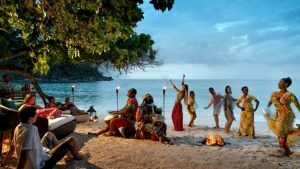 The Seychelles performance is in step with the growth in global international travel, which the United Nations World Tourism Organisation (UNWTO) published was the strongest result in seven years. According to the UNWTO, international tourist arrivals climbed to 1,323 million in 2017 — an increase of 6.8 per cent compared to the same period in 2016. Seychelles is known to offer diversity in product from the very high quality to visitors to the Seychellois ‘Home Grown’ block of accommodation network where the Seychellois culture and feeling is the centre point. The wide range of 5 Star Resorts, the One Island – One Hotel group, the smaller island styled hotels, attractions and activities enables Seychelles to be a destination for the discerning travellers looking for a tropical island for their holidays. This diversity on offer has made it easier to deliver on visitor expectations, visitor experiences, and put into perspective the question of value for money. Has Seychelles as a whole agreed that tourism is the industry worth protecting and that it should take into consideration the fact that year after year income for the island from tourism keeps the Seychelles economy floating nicely. This is over and above the employment positions available to Seychellois. Too often it is heard that each and every family in Seychelles has someone employed in the tourism industry or has invested directly into the tourism industry. This is why every responsible Seychellois must support this vital industry and ensure the National Assembly of the islands ensures adequate funding is available for the continued marketing of Seychelles. The people of the islands on their part have to ensure that Seychelles’ tag line as a safe tourism destination is protected and safeguarded. Seychelles is one of the safest destinations in the world and this we need to ensure we remain so. But we also must double our efforts in ensuring mare is available for our visitors to do. They cannot spend and increase the island’s yield from the industry that has become the pillar of its economy if they do not have things to do. This is why innovations by Destination Management Companies (DMCs) is important and why the Tourism Board must ensure each service provider is well publicised so that visitors are tempted to move out of their hotels to have a better experience of the sights and sounds of the Seychelles.